The tradition of patchwork and quilted items goes back hundreds of years and most often conveys a sense of warmth and comfort. While the bold and bright designs in this book are meant for the modern crafter, that inherent sense of warmth is still expressed in these unique and stunning projects. Created in the distinctive Japanese craft style--and published in English for the first time--the projects in this book offer a look that is minimal, yet vibrant and full of life. Explore the techniques of patchwork sewing, appliqué, and machine quilting through thirty-five simple and stunning projects. With beautiful photographs, step-by-step instructions, and detailed diagrams, the pouches and handbags, quilts and pillowcases, tissue cases and pot holders are perfect projects for beginner and intermediate sewers. 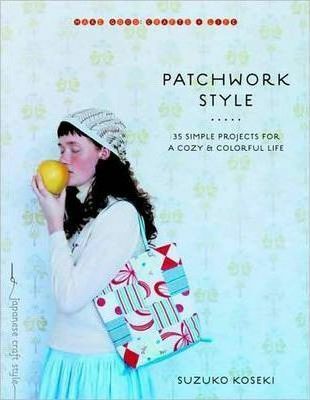 Make the projects in this book and add a little bit of warmth and patchwork style to your life. Suzuko Koseki's quilting art has appeared in many exhibitions. She teaches in Japan at the main school of the Heart and Hands Patchwork School, as well as at the Asahi Cultural Center, and the Vogue Quilt Institute.